If you ever suffer from stomach sensitivities yourself, it might not come as a surprise that your canine companion can experience similar issues from the ingredients found in their food. Around 10% of pups suffer from allergies or sensitivities causing gastrointestinal discomfort and poor digestion. Luckily, with the help of special food with allergy-free ingredients, it doesn’t need to be that way! Before changing your dog’s diet, it’s important to get a proper diagnosis from your veterinarian as their symptoms could be caused by more serious conditions that a change in diet won’t fix. Once you’ve determined the likely cause of your dog’s sensitive stomach, you can begin the search of finding the best diet to suit their needs. To help you out, we compiled a short list of the best food for dogs with sensitive stomachs. Each product contains healthy ingredients while being free of most common allergens, let’s look at them now. This popular dry kibble for adult dogs contains no wheat, soy, corn, or artificial colors and flavors. Instead you’ll find healthy ingredients like salmon, rice, prebiotic fiber, and antioxidants that promise to contribute to a healthy digestive system. Salmon is the #1 ingredient. This is important because high-quality ingredients are easier for dogs to digest but many brands contain a higher ratio of filler to healthy ingredients. It has a reasonable price-tag, especially when you consider the quality of ingredients used. While you can’t put a price tag on your dog’s health, it is always nice to find high-quality ingredients on a budget. The “feel-good” ingredients that help your pup avoid stomach and skin irritation, so they can happily move on with their day. The addition of prebiotic fiber that promises to aid with healthy digestion. 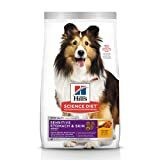 Hill’s Science Diet promises a nutritionally-balanced formula that is gentle enough for our canine pals with sensitive skin and stomach issues. It contains wholesome ingredients like chicken and pearled barley and is rich in omega-6 fatty acids and antioxidants to encourage a glossy coat and strong immune system. It’s free from artificial colors, flavors, and preservatives which can all cause problems in pups with sensitive tummies. Most customers have reported a substantial improvement in their pup’s allergy symptoms since switching to Hill’s Science Diet for Sensitive Skin & Stomach. The real ingredients like chicken, barley, and peas. Most pups love the flavor of this food and won’t hesitate to gobble it up! The decrease in uncomfortable allergy symptoms like itching and stomach upset. Your pup can finally get back to living their best life! 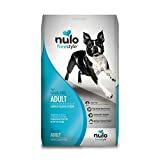 If grains are a digestive nightmare for your pup, you might want to give Nulo Freestyle Grain-Free dog food a try. It’s available in different flavors like salmon, lamb, and turkey so you’ll be sure to find something that your dog will enjoy. It’s free from fillers like white potato and tapioca with almost all its protein (85%) coming from animal sources. We think this is important because grains are a common trigger for pups, and we want the best for our canine companions! The addition of beneficial nutrients like Omega-3 and Omega-6 fatty acids. Both of which are important for a healthy, shiny coat. None of the flavor combinations contain egg or chicken protein. We think this is important to note as many dogs can be sensitive to these ingredients. The high-quality protein promotes lean muscle development, so your pup will have long-lasting energy all day long. The different flavor combinations: Turkey & Sweet Potato, Lamb & Chickpea, and Salmon & Peas. Your dog will enjoy every bite while experiencing no sensitivity issues! Nutro’s Limited Ingredient Diet formula promises 10 or less key ingredients in each bag of food. Instead of filler, you’ll find healthy ingredients and your dog should experience less sensitivity difficulties. It’s free from common sensitivities like corn, wheat, soy, and dairy protein. Instead you’ll find high-quality protein sources like lamb and an assortment of important nutrients and minerals to keep your dog healthy. Lamb is the #1 ingredient, so you can be sure that your dog is getting the high-quality protein they need for muscle development and optimal health. It’s free from common allergens and GMOs ensuring the high-quality standards you expect for your pup. The use of real ingredients like New Zealand lamb and sweet potato. A delicious flavor combination your dog will be sure to love. It contains an array of important vitamins and minerals like Vitamins D & B and Taurine for optimal long-term health. 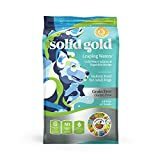 This holistic-style of dog food from Solid Gold contains no chicken protein making it an ideal choice for dogs suffering from a protein sensitivity. Instead, you’ll find high-quality ingredients like Coldwater salmon and vegetables that are more suitable for our sensitive canine companions. It’s free from other common sensitivities like corn, wheat, and soy and is full of healthy, fiber-rich prebiotics to keep your dog’s digestive system running smoothly. The addition of popular superfoods like carrots, blueberries, pumpkin, and kelp so you can be sure that your dog is eating a nutritionally-sound meal everyday. The health benefits for your dog’s skin and coat. Thanks to the addition of Omega-3 and Omega-6 Fatty Acids it won’t take long to notice a healthy shine in your dog’s coat! The use of high-quality ingredients like salmon, chickpeas, and lentils that will help ensure your dog has the energy he needs to keep his muscles strong and immune system functioning normally. The grain-free formula. Grains are a common filler used in most dog food despite the common sensitivities among our canine friends. Here are some commonly-asked questions, but please remember that if you’re concerned with your dog’s health, the best thing you can do is plan a trip to see your vet, or even an emergency vet if the symptoms are severe or worsening. How can I tell if my dog has a sensitive stomach? What is the easiest food for a dog to digest? When choosing a food that will be easy for your dog to digest, you want to look for lower fat options because fat is harder for dogs to digest than carbohydrates or protein. If you know that your dog isn’t allergic, lean cuts of meat like boiled chicken, turkey, salmon, and tuna are great options. Gluten-free carbohydrates like sweet potato, canned pumpkin, and white rice are typically well-received by most dogs as well. What ingredients should I avoid if I think my dog has a sensitive tummy? The most common allergens for dogs are dairy, wheat, eggs, and protein sources like chicken, beef, eggs, and lamb. When choosing a food for your pup, it’s best to avoid food that contain any of those ingredients until you know what is causing their symptoms for sure. Are eggs okay for a dog with a sensitive stomach to eat? Depending on what is causing your dog’s sensitive stomach, cooked eggs are a nutritious source of digestible protein. However, eggs are high in fat so if your dog is prone to gastrointestinal issues, it might be best to keep them as an occasional treat. Should I feed my dog more wet food if they have a sensitive stomach? Although we focused on dry kibble for this article, wet dog food can be easier for some dogs to digest. If your dog is experiencing a lot of stomach upset, you might consider replacing some of their kibble with wet dog food until symptoms subside. 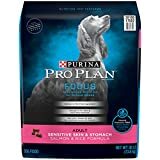 Can I give my dog anything to help settle their sensitive stomach? If your dog is experiencing stomach upset, you can try offering them foods like boiled potatoes, canned pumpkin, white rice, and vet-approved probiotics until symptoms subside. You should avoid giving your dog table scraps and give them smaller meals throughout the dog if eating quickly is a problem for them. If your dog suffers from stomach sensitivities, it’s important to get them on a diet that suits their dietary needs. This will prevent more serious complications from occurring and keep your dog energized and healthy for the years to come! While switching your dog to a new diet, remember to do so gradually as a sudden change in diet can also cause issues of its own. Most people recommend gradually increasing the ratio of new food to old food over a 7-day period for best results.